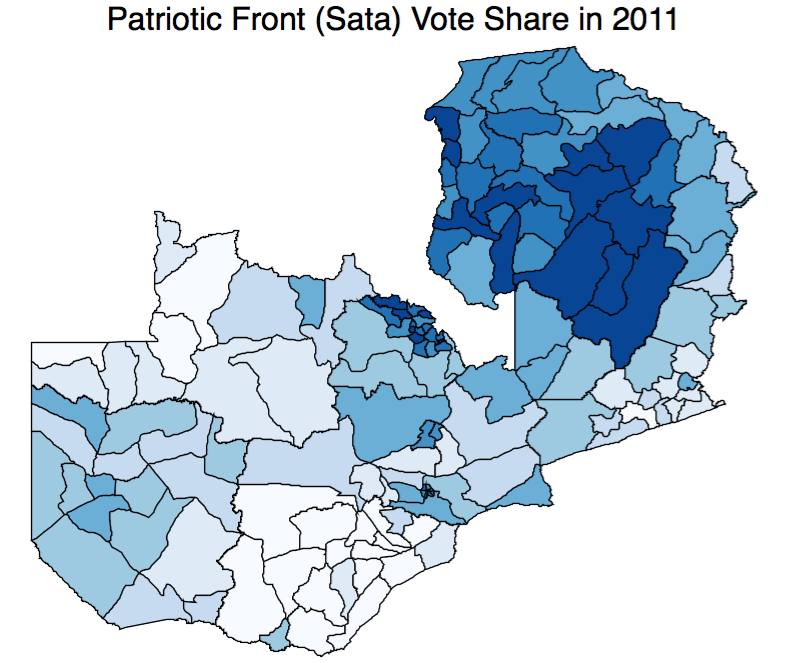 Sata is leading 47% – 34% in the latest confirmed results from the electoral commission of Zambia. Most of these confirmed results are from Sata strongholds. Banda will almost definitely narrow the gap once the numbers from his base get put on the board. Results (not yet confirmed by the electoral commission of Zambia) posted on Zambian Economist indicate that PF has won 49/150, MMD 13/150 and UPND 4/150 of of the 66 constituencies with results. It looks like turnout was high in the election (might reach the low 60s) which is good for the opposition Patriotic Front. PF will definitely be the biggest political party in parliament. Preliminary presidential results are expected to be announced later this evening. From back of the envelope calculation of the already announced constituency results it appears that Sata is ahead by a sizable margin. It is important to remember that most of the results are from the urban areas of Zambia. 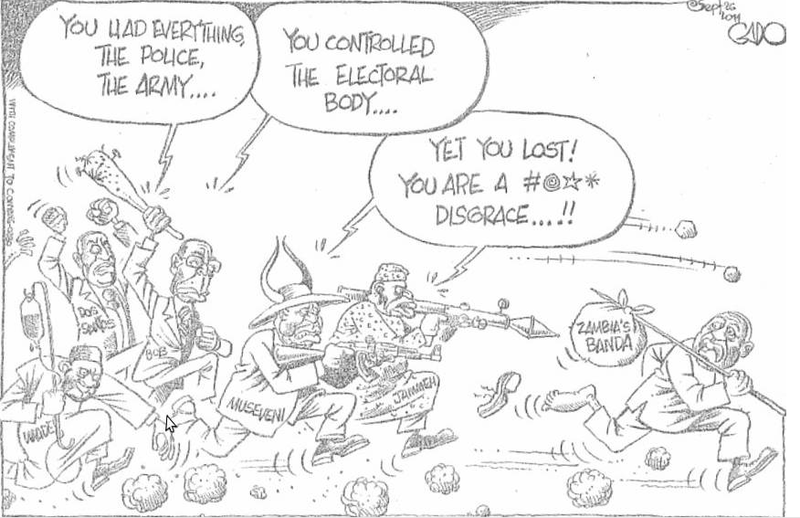 The MMD and Mr. Banda will definitely have a strong showing once the results from the countryside start trickling in. Unconfirmed reports indicate that PF has scooped all 22 seats on the Copperbelt, all the seats in Lusaka, 12 out of 14 in Luapula. Banda has a wide lead in Eastern Province. MMD has apparently won all seats except one. Turnout numbers are still not here yet. Presidential results still under wraps. Will update as I get more results. Texas in Africa’s review of Fighting for Darfur. Blattman on economic growth and development. The long arms of the Rwandan state? 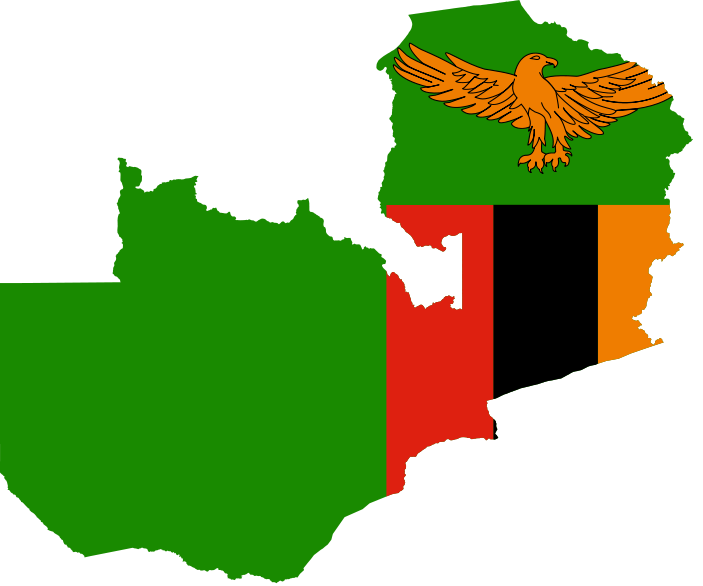 The Zambian elections will be close. Last time round the opposition leader lost by a mere 3% (I will be there for the campaigns this summer). And lastly, Kenya’s trillion-shilling proposed budget. High on development expenditure but could it crowd out the private sector? The Democratic Republic of Congo is in a deep hole. And it is not just because its president, the younger Kabila, wants to extend presidential terms by 2 years and then may be abolish term limits, at least according to the Economist. It is primarily because almost everyone in the country seems to have incentives to keep the war in the east raging on – well, everyone except the civilians on the ground. The New York Times reports that an upcoming UN Report will implicate bigwigs in the Congolese army of colluding with rebels in the east to profit from illegal mineral exports, among other commodities. FDLR, the rebel outfit which has among its ranks remnants of the genocidal Intarahamwe from Rwanda, is among the chief beneficiaries. The Congo conflict is more than anything else an economic conflict. It will only stop when those profiting from it come to their senses (I don’t know what will prompt this if 5 million deaths and counting can’t do the trick). And the web of war-profiteers is huge. Meanwhile in Zambia, it’s everything goes like it is still 1991. A section of donors have suspended aid to the health ministry because $ 2.1 million went missing (“more than 100,000 Zambians die every year from malaria and HIV/AIDS”– Economist). The government is reluctant to fight corruption. Mr. Rupiah Banda, the current president, seems bent on becoming the new Frederick Chiluba – the kleptocrat who ruled Zambia for ten years. Things never change.